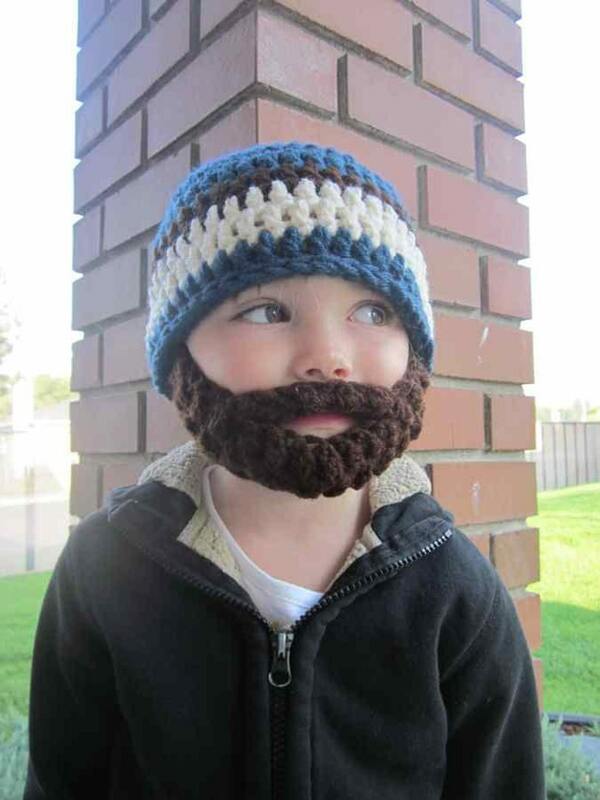 You've found the ULTIMATE Bearded Mix Beanie for KIDS! This unique Beard and Beanie fits most younger kids ages 1-5ish! This Standard Beanie measures un-stretched about 19” head circumference and 7.5" from back center of head to just in front of the ears. PLEASE SPECIFY recipient's age in Purchase Notes so we can get the right size to you. PREFER A DIFFERENT BEARD COLOR? Let us know in the Purchase Notes as well! This Bearded Beanie comes with both sides sewn in. If you are an international customer and you don't see your country listed in the shipping options, please shoot us a message and we'll see what we can do. Thank you! Item ships USPS within 2 weeks of payment received. Visit our OTHER ETSY SHOPS today! Shipped quick and very well made! I can't wait to get a shot of my godson wearing this, keeping him warm and bringing the warmth of laughter to all. Adorable bearded baby beanie pattern! We accept a variety of payment methods including Paypal and Credit Cards. Pattern Purchases are non-refundable. Please read all the information included in the listing. --The measurements were checked beforehand and sizing is not the issue. --A mistake was made on our part. In the case of a lost-in-the-mail item, a partial refund can be processed but the shipping fees will not. If requested, we can ship Priority Mail but you will need to to discuss the fees and create a custom listing for you to purchase. Also, if you request a Signature Confirmation or Additional Insurance please talk to me about it before ordering. --Shipping to Canada is a lengthy process. Please do not order without 20 days of shipping time in your plans. --We CANNOT ship to addresses not written in English. If we see an address like that, we will try to contact you to get the English version. If we cannot get a hold of you, your order will be cancelled and a refund processed.